Back around Halloween I caught some sort of plague. I thought it was the flu. I ignored it. It turned out to be pneumonia. That was much harder to ignore. It knocked me flat. Eventually, and after many attempts to avoid the issue, I gave in and realized I needed to actually rest (rather than just claiming to rest and instead continuing to do too much stuff). At that point, I came to the conclusion that I needed some soothing knitting. These socks were the result. 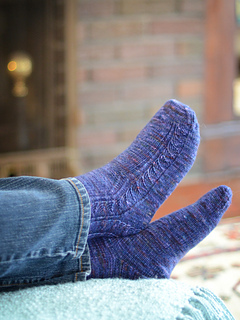 They are easy to knit, even if you’ve had a bit too much cold medicine. 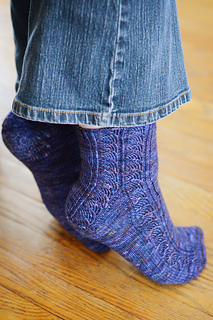 All the patterning is kept to one little panel that runs down the outside of your ankle (the rest of the sock is plain, calming, meditative stockinette). Even the pattern itself is easy to memorize. 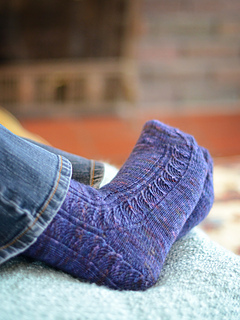 To keep them from being too soothing (I wouldn’t want you getting bored), the socks are mirrored and there is a bit of unusual shaping in the gusset. 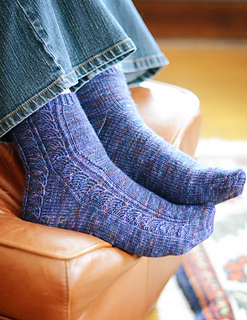 The end result is that most marvelous creation, a sock that looks impressive but is actually easy to make. Best of all, no plague required!